SALEM, Ohio — All across Ohio, the farming community is coming together to help farmers devastated by flooding in the Midwest. A late winter storm March 13 brought blizzards, floods and a tornado across more than 25 states, stretching from the northern Rocky Mountains to Texas and beyond. The storm’s effects continue to make an impact in Nebraska, Iowa, South Dakota and Missouri where flooding has taken place and is to blame for three deaths to date. In a news release issued March 19, Gov. Pete Ricketts said there have been deadlier disasters in Nebraska but never one as widespread. He said 65 of the state’s 93 counties are under emergency declarations. Farmers have lost structures, animals and supplies. 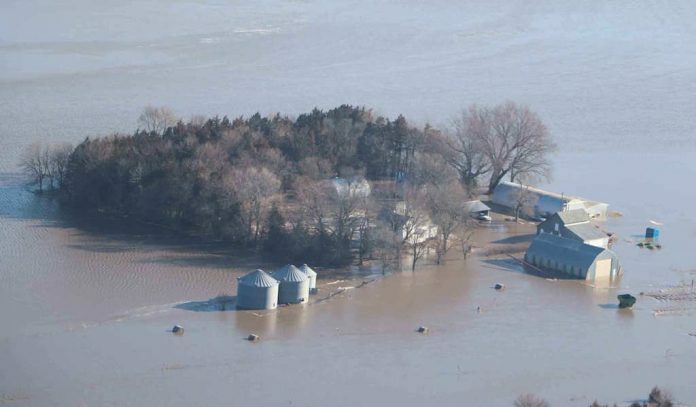 And the flooding may just be beginning for other farmers across the U.S., as the flooding could hit parts of southern states along the Mississippi River. 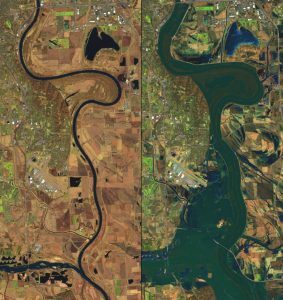 This satellite photo, courtesy USGS/NASA Landsat, shows the extent of flooding on the Platte, Missouri, and Elkhorn rivers southeast of Omaha, Nebraska. The photo on the left shows the area in March 2018, compared to the photo on the right side, taken March 16, 2019. Ohio’s Rural America Relief, which got it start in 2017 to help with wildfire relief in Kansas, is pitching in once again. Rose Hartschuh, who participated in the relief efforts in 2017, said it was eye opening to see the amount of need there was in Kansas, which triggered their efforts to help Nebraska. While they know there is a lot of need in surrounding states, they are focusing on Nebraska. Hartschuh said 20 volunteers are planning to leave March 29 with six to seven trailers of donated supplies. They will be delivering supplies March 30 and volunteering through March 31. The amount of devastation is still being assessed, so Hartschuh is not exactly sure where they will be headed. OSU Extension in Wayne County is also putting together a supply drive, a result of 4-H clubs expressing interest in helping those in Nebraska, said Sarah Boreman, 4-H program assistant. This effort is accepting supplies until March 27 at drop-off sites at the Centerra Country Store and Rural King in Wooster and Centerra Country Store in West Salem. Both efforts need these supplies: first aid kits, bandages, lip balm, cold/hot pack, cotton swabs, cotton balls, cough drops, eye wash, flashlight, hand sanitizer, latex gloves, saline solution, scissors, cloth or paper rags, disposable gloves, baby wipes or wet wipes, garbage bags, all sizes of resealable plastic bags, deodorant, hand lotion, hand soap, shampoo/conditioner, socks, toothbrush, toothpaste, wash cloth, hand tools, pitch forks, rakes (heavy duty), flat face square shovels, scoop shovels, alcohol swabs or bottled rubbing alcohol, work gloves, pans, buckets, pails, pocket knives, batteries, fence repair tools and supplies, fencing pliers, linesmen pliers, t-post clips, fencing staples, iodine, gloves/ob sleeves, stretch gauze bandage rolls, rectal thermometer, livestock probiotics, pill gun, vet wrap, Blu-kote, scarlet oil, Red-kote, electrolytes, tweezers, 12 and 20 cc syringes, 16×1 needles and 5 gallon buckets. Wooster: BJ and Marlene Eick, Herdmark Media.